Plant milk (alternative milk, nut milk or vegan milk) is a manufactured, non-dairy beverage made from a plant extract for flavoring and aroma. Plant milks are consumed as a plant-based alternative to dairy milk, and to add a vegan beverage choice with creamy mouthfeel. For commerce, plant milks are typically packaged in containers similar and competitive to those used for dairy milk. In 2018 among some 20 plant sources used in plant milk manufacturing, almond, soy, and coconut were the highest-selling plant milks worldwide. The global plant milk market was estimated at US$16 billion in 2018. Plant-flavored beverages have been consumed over centuries, with the term "milk-like plant juices" used since the 13th century. Across various cultures, plant milk has been both a traditional beverage and a flavorful ingredient in sweet and savory dishes, such as the use of coconut milk in curries. Plant milks are also used to make ice cream, plant cream, vegan cheese, and yogurt, such as soy yogurt, with 54% of consumers open to selecting plant-based products over dairy in 2018. 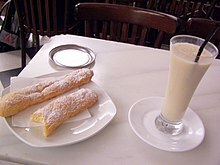 Horchata, a beverage originally made in North Africa from soaked, ground and sweetened tiger nuts, spread to Iberia (now Spain) before the year 1000. In English, the word "milk" has been used to refer to "milk-like plant juices" since 1200 AD. Recipes from the 13th-century Levant exist which describe the first plant milk: almond milk. Soy was a plant milk used in China during the 14th century. In Medieval England, almond milk was used in dishes such as ris alkere (a type of rice pudding) and curry chicken (appearing in the recipe collection, The Forme of Cury). Coconut milk (and coconut cream) are traditional ingredients in many cuisines, and are often used in curries. Plant milks may be regarded as substitutes for dairy milk in western countries, but have traditionally been consumed in other parts of the world, especially ones where there are higher rates of lactose intolerance (see especially lactose intolerance: epidemiology section). Common plant milks are almond milk, coconut milk, rice milk, and soy milk. Other plant milks include hemp milk, oat milk, pea milk, and peanut milk. A blend is a plant milk created by mixing two or more types together. Some examples of blends are almond-coconut milk and almond-cashew milk. Other traditional plant milk recipes include kunu, a Nigerian beverage made from sprouted millet, sorghum or maize; Sikhye, a traditional sweet Korean rice beverage; and Amazake, a Japanese rice milk. The actual content of the highlighted plant in commercial plant milks may be only around 2%. Other ingredients commonly added to plant milks during manufacturing include guar gum, xanthan gum, or sunflower lecithin for texture and mouthfeel, select micronutrients (such as calcium, B vitamins, and vitamin D), salt, and natural or artificial ingredients—such as flavors characteristic of the featured plant—for aroma, color, and taste. Plant milks are also used to make ice cream, plant cream, vegan cheese, and yogurt, such as soy yogurt. Generally because plant milks are manufactured using processed extracts of the starting plant, plant milks are lower in nutrient density than dairy milk and are fortified during manufacturing to add precise levels of micronutrients. To improve competition, plant milks are typically packaged in containers similar to those of dairy milks. Advertising for plant milks may contrast the intensive farming effort to produce dairy milk with the relative ease of harvesting vegan sources, such as oats, rice or soybeans. Globally, plant milk sales grew steadily by 61% over the period 2012 to 2018. Among plant milks, almond (64% market share), soy (13% market share) and coconut (12% market share) were the leaders in the category. Plants milks may be labeled to highlight their nutrient contents, or with terms reflecting their composition or absence of ingredients, such as "dairy-free", "gluten-free" or "GMO-free". In December 2013, European Union regulations stated that the terms "milk", "butter", "cheese", "cream" and "yogurt" can only be used to market and advertise products derived from animal milk, with a small number of exceptions including coconut milk, peanut butter and ice cream. In 2017, the Landgericht Trier (Trier regional court), Germany, asked the Court of Justice of the European Union, to clarify European food-labeling law (Case C-422/16), with the court stating that plant-based products cannot be marketed as milk, cream, butter, cheese or yogurt within the European Union because these are reserved for animal products; exceptions to this do not include tofu and soy. In the United States, the dairy industry has petitioned the FDA to ban the use of terms like "milk", "cheese", "cream" and "butter" on plant-based analogues (except for peanut butter). A 2018 survey by the International Food Information Council Foundation suggests consumers in the United States do not typically confuse plant-based analogues with animal milk and dairy products. Labeling regulations for plant-based products with names such as "milk" or "yogurt" were under review, as of 2018. US Food and Drug Administration commissioner, Scott Gottlieb, stated on July 17, 2018 that the term "milk" is used imprecisely in the labeling of non-dairy beverages, such as soy milk, oat milk and almond milk: "An almond doesn't lactate", he said. ^ a b c Benjamin Kemper (15 August 2018). "Nut Milks Are Milk, Says Almost Every Culture Across the Globe". The Smithsonian. Retrieved 20 March 2019. ^ a b c d e Sethi, Swati; Tyagi, S. K.; Anurag, Rahul K. (2 September 2016). "Plant-based milk alternatives an emerging segment of functional beverages: a review". Journal of Food Science and Technology. 53 (9): 3408–3423. doi:10.1007/s13197-016-2328-3. ISSN 0022-1155. PMC 5069255. PMID 27777447. ^ a b c d e f g h i Oliver Franklin-Wallis (29 January 2019). "White gold: the unstoppable rise of alternative milks". The Guardian. Retrieved 20 March 2019. ^ a b "Milk: Origin and meaning of milk". Online Etymology Dictionary, Douglas Harper. Retrieved 4 November 2018. ^ Donna Berry (6 December 2018). "State of the industry: Dairy". Food Business News. Retrieved 20 March 2019. ^ a b Zaslovsky, Nancy. "horchata". In Goldstein, Darra (ed.). The Oxford Companion to Sugar and Sweets. Oxford University Press. p. 341. Retrieved 4 July 2018. ^ Cho, Susan; Almeida, Nelson (29 May 2012). "Dietary Fiber and Health". CRC Press – via Google Books. ^ McSparran, Frances. "Middle English Dictionary Entry". Middle English Dictionary. University of Michigan. Retrieved 4 November 2018. ^ Fraser, Andrew. "Cooking in the Middle Ages, recipe reconstruction". History Alive. Queensland Living History Federation. Retrieved 4 November 2018. ^ a b c Meagan Bridges (1 January 2018). "Moo-ove Over, Cow's Milk: The Rise of Plant-Based Dairy Alternatives" (PDF). Practical Gastroenterology, Nutrition Issues in Gastroenterology, Series #171; University of Virginia School of Medicine. Retrieved 20 March 2019. ^ a b Vanga, Sai Kranthi; Raghavan, Vijaya (2 November 2017). "How well do plant based alternatives fare nutritionally compared to cow's milk?". Journal of Food Science and Technology. 55 (1): 10–20. doi:10.1007/s13197-017-2915-y. ISSN 0022-1155. PMC 5756203. PMID 29358791. ^ a b Zeki Berk (1992). "Soymilk and related products; In: Technology of production of edible flours and protein products from soybeans". UN Food and Agriculture Organization. ISBN 92-5-103118-5. Retrieved 20 March 2019. ^ "Milk, whole, 3.25% milkfat, with added vitamin D", United States Department of Agriculture, Agricultural Research Service. ^ "Soymilk (all flavors), unsweetened, with added calcium, vitamins A and D", United States Department of Agriculture, Agricultural Research Service. ^ "Beverages, almond milk, unsweetened, shelf stable", United States Department of Agriculture, Agricultural Research Service. ^ Dayna Fields (31 January 2019). "Investors Thirst For Plant-Based Milks". Forbes. Retrieved 20 March 2019. ^ Charlotte Rogers (2 January 2019). "How marketing is fuelling the 'post-milk generation'". Marketing Week. Retrieved 20 March 2019. ^ Tim Lewis (11 November 2018). "How we fell out of love with milk". The Guardian. Retrieved 20 March 2019. ^ a b "US non-dairy milk sales grow 61% over the last 5 years". Mintel. 4 January 2018. Retrieved 20 March 2019. ^ "EU court bans dairy-style names for soya and tofu". BBC News. 14 June 2017. Retrieved 23 December 2018. ^ "Judgment in Case C-422/16 Verband Sozialer Wettbewerb eV v TofuTown.com GmbH" (PDF). Court of Justice of the European Union. Luxembourg. 14 June 2017. Retrieved 23 December 2018. ^ a b "What's in a Name? : The Use of Dairy Product Names in Labeling of Plant-Based Alternatives". Science Meets Food. 13 December 2018. Retrieved 23 December 2018. ^ "What's in a Name? Survey Explores Consumers' Comprehension of Milk and Non-Dairy Alternatives". FoodInsight.org. 11 October 2018. Retrieved 23 December 2018. ^ "Use of the Names of Dairy Foods in the Labeling of Plant-Based Products". Federal Register. 28 September 2018. Retrieved 23 December 2018. This page was last edited on 2 April 2019, at 05:03 (UTC).